We are currently switching from Rest-Services version 3.1 to 3.2 and facing problems with changed responses. With API version 3.1 the following request for a non existing document will return XML that contains information about the document and the state not found which is correct. 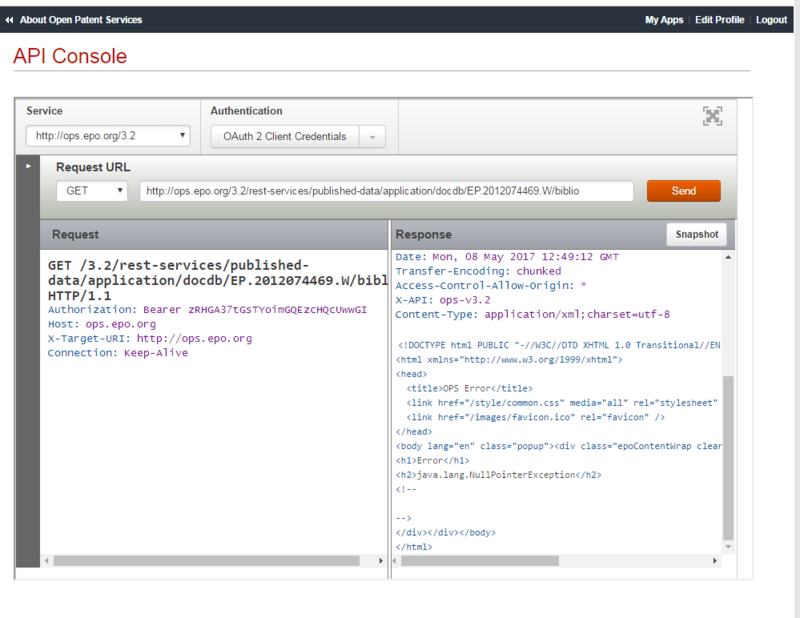 The problem was reproduced with the API console at developers.epo.org. With API version 3.2 the same request has a different response. Now the server responses with the http code 404 and a fault message saying that the entity was not found. I red the migration guide again and I could not find any information about this changes. Will this behaviour stay the same? Are there further changes like this that you could tell me? Please let me know, if you have any further questions. Last edited by TSpitz on Wed May 03, 2017 1:42 pm, edited 1 time in total. Version 3.2 is official production version and the only one we update/amend at this point. This version also gives you correct URL error response. Version 3.1 gave you wrong response for a non-existing document. You’ve a 200 OK response that is actually only supposed to appear for successful queries - and clearly, your query was not successful due to non existence of the D1 kind code for DE document. But this is not a change, it’s a bug in an old system which won’t be corrected. Version 3.2 tells you correctly that such document does not exist in a database - you get 404 Not Found URL response. Thank you for that quick response! At 3.1 I get the whole data sheet. Why will be 404 error code returned instead of the data sheet? the fix in 3.2 was done in a scope of CQL harmonization between Espacenet and OPS. Even if I change the brackets according to your recommendation, I don't get the correct results. How should I formulate the query searching for the application number ap='EP2012/074469'. I want to get the referred file 'WO 2013083615'. In my opinion something other in search algorith must have been changed. OPS CQL searxch is better option for keyword search, for number search you should rather use OPs Publish data service. I will be explaining all about the number formats in my OPS WebEx session in June so maybe it will be of benifit if you join. the main goal is the search after a publication number. Nothing is wrong, v 3.2 is not available to be used anonymously, you have to go into API Console, choose v 3.2 and choose default authentication and then you have to repeat the search using console to get the same result/URL. You have all choices to search mentioned in console, so you can search with whatever number you like, it can be application, priority or publication number. Console is really quite self-explanatory and it gives you all available options for each service. I’ve only showed you both URL’s so you can reproduce them in Console and not to click on it to get a result. That only works for 3.1 old version because that one allows anonymous access and the new one doesn’t. i know that anonymous access is in 3.2 not available anymore. I have tried with the API-Console (logged in with token, see Screenshot). Other URL's are working.